When your iPhone device battery is low ensure that you make use of the device up to its least playback period. If your device is showing unpleasant face, it means that your device needs to be restored or it is attached to an unsupported system. Once your device is locked up, check the battery level and make sure that the hold key is not locked. If it is displaying a folder with an exclamation mark, this signifies that you need to reset the device. If your device shows a message “unknown error has occurred”, it may occur because of some corrupted files or software malfunction the player is not synchronizing with iTunes. In this kind of situation, you have to upgrade the software. However, the solutions haven’t mentioned about the music missing problem, you may want to know how to restore music on iTunes. Step 1: Open iTunes on the computer that you used to backup your device. Step 2: Use a USB cable to connect your mobile device to your computer. Step 3: Click on your iPhone device when it displays on the iTunes. 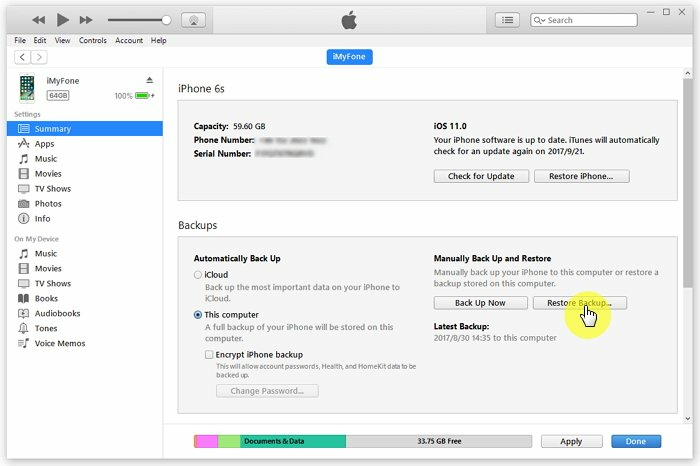 Step 4: Choose "Restore backup" on iTunes. 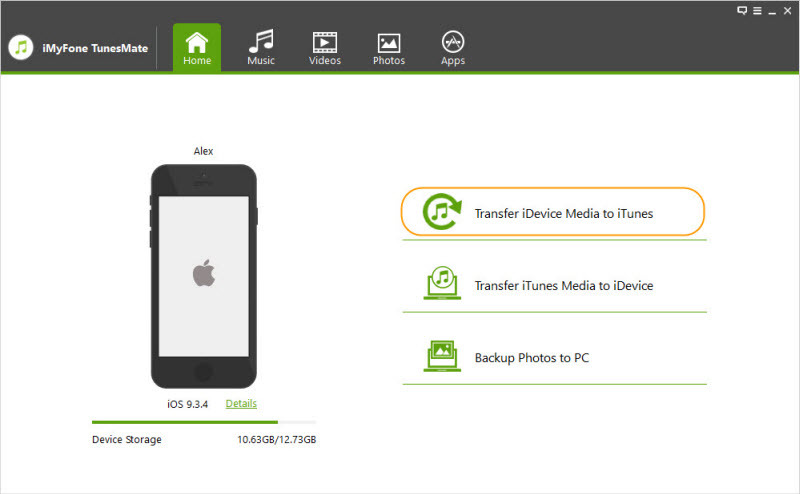 Step 5: Select the most relevant date and size of each backup. Step 6: Click on “Restore” and wait for some minutes for the process to complete. Don’t forget to select a backup to restore your music. Step 7: Make sure your device is connected its restarts. Wait for some minutes to synchronize with your computer. After syncing your device, you can disconnect it. It is possible to restore your iTunes library from your external storage drive to your PC. Step 1: Exit the iTunes. Step 2: Locate the external storage device on your computer. Step 3: Drag the iTunes folder you backed up earlier from your external device to the folder you want it on the internal drive. Step 4: Press Shift key on your computer when opening iTunes. Step 5: Click on the “Choose iTunes library”. 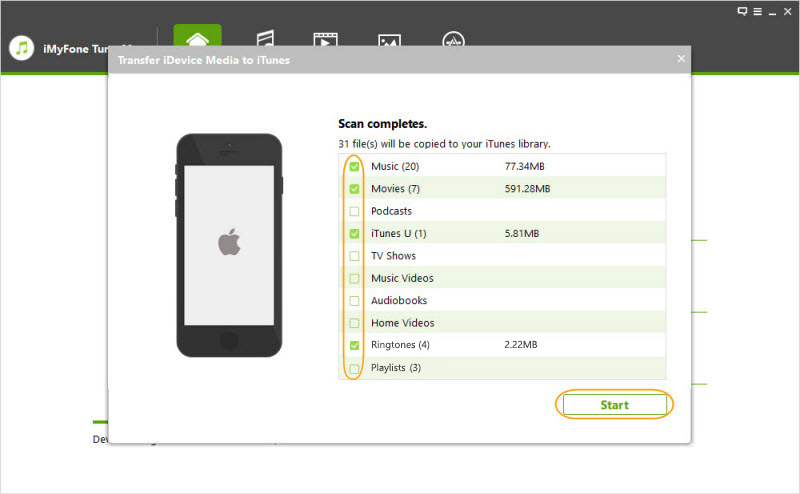 Step 6: Select the iTunes file in the third step from your internal storage device. Step 7: Click open and choose the iTunes library file inside. iMyFone TunesMate is the best options for both Windows and Mac users using iPhone devices. The software helps to move and restore iPhone music on iTunes without causing any damage to your iTunes library. All you need to do is to drag your files and drop them in the local library. Duplicates and transfer missing music from iPhone to iTunes library. Export music to iTunes from iPhone without losing data. With one-click, you can transfer your playlist to your desired location. Support both purchased and free songs. Transfer music to iTunes library/computer/ external hard device easily. Support almost all the media formats. Step 1: Open iMyFone TunesMate on your PC and connect the iPhone device. Step 2: On the home interface, select “Transfer iDevice Media to iTunes”. It will automatically scan all the media files on your iPhone device. Step 3: When you are done with the scanning process, check “Music” and click on “Start” to transfer. It is easy to learn how to restore music on iTunes via redownload music. All you need to do is to sign in with the Apple ID that you used to download the music before you can redownload music on iTunes. Ensure that you install the latest iTunes version. You can check your purchase history if you have any issue with subscriptions and billing. Step 2: Click on “More” on your iPhone device. Click on “Purchased” from your device. Step 3: Tap on the Music you wish to redownload. Step 4: Click on the download button in the right corner. 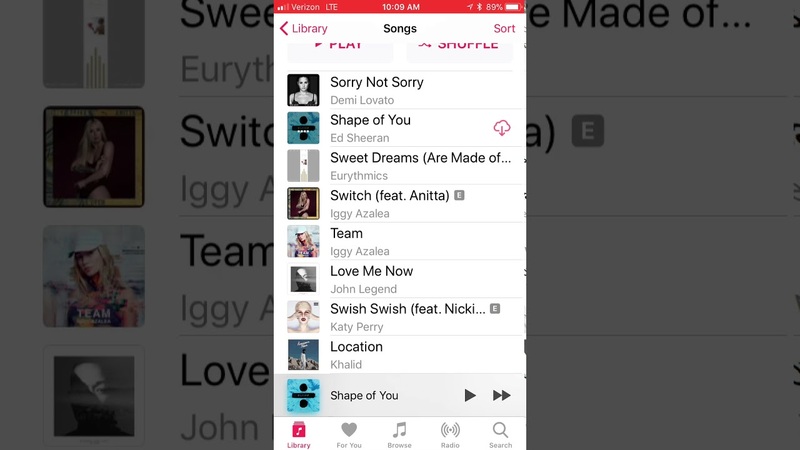 You will see the music that you want to redownload on the music app. Step 1: Open the iTunes app and sign in using your Apple ID. Step 2: Select “Account” from the top bar on your PC home screen. Click on “Purchased”. Step 3: Click on music at the top right corner on the iTunes home screen. Step 4: When you locate the music you wish to redownload, click on the download button at the top right corner. The music will download to your iTunes library directly.